One of the port cities of Gujarat, Mandvi is located in the Kachchh district. The city is 56 km southwards of Bhuj and is popular for its shipbuilding yard. These ships are constructed by hundreds of men for Arab merchants. The wooden raw material for these ships comes from Malaysian rainforests. Located on the shore line, the city is famous for some amazing beaches where one can relax and enjoy the soothing beauty of nature. Moreover, Mandvi is home to various old buildings and temples which are carved with cartoons on front. Presence of ancient artifacts makes Mandvi one of the popular tourist destinations. 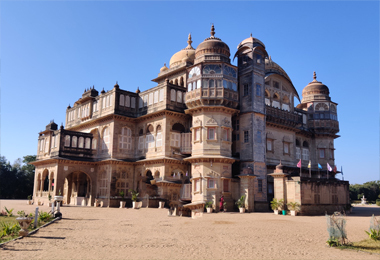 Tourists in great numbers flock the city to visit the amazing Vijay Vilas Palace. It is one of the luxurious heritage resorts, settled on the sea shore, 7 km west of Mandvi city. The roof of the palace offers its visitors with a splendid view of the beach. In order to make your stay comfortable the luxurious bungalow provides you with all the modern facilities.